Hello, and welcome to the second post in our two-part series introducing some differences between American and British English! A few days ago we looked at (and listened to) some differences in pronunciation and accent, and today we’ll look at another difference: vocabulary. I decided to focus on pronunciation and vocabulary because they are what I notice most when talking with British English speakers. There are in fact a few grammatical differences between the two languages (you can read a little more here), but the biggest differences seem to be in these two areas. But first, I have a question for you, reader: What type(s) of English do/did you learn or speak? If you learned one style of English, did your teacher or textbook ever comment on other types of English? I’m just curious about your experiences. As you may know, I grew up in Colorado, in the USA, so when I was a child, I was exposed almost exclusively to American English. I did watch some British and Australian movies, but I never really thought much about the differences until I was 18, when I went to Germany as an exchange student. Yes, Germany. Even though I learned a lot of German, I still went to some English classes at the German school I attended, and there the teachers and most of the students spoke British English. At least in class; if I talked in English to German friends outside of class, many of them then tended to use more American expressions and accents, especially if they had watched a lot of American TV or movies, or listened to a lot of American pop music. So, what’s the point? Are British and American English words really that different? I’d say yes and no. I can think of only a few instances where a vocabulary difference can cause a major problem or a complete breakdown in communication. Usually, if you speak British English to an American English speaker, he or she will understand almost all of what you say; if there are any vocabulary differences, either the speaker or listener can ask for clarification, until there is mutual understanding. Let me give you an example. I have a Danish cousin who went to school in England and who, as a result, generally speaks English with a British accent. I mentioned once that I was going to try to buy a new pair of pants, and he laughed at me. 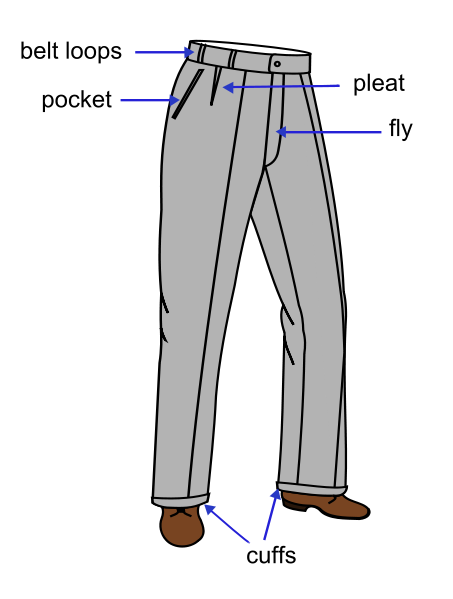 That’s when I learned that in British English, “pants” is used to describe underwear, and most men wear “trousers.” There are many examples of vocabulary differences like that, but they’re more likely to make people laugh than to cause a communication problem. The two aspects in which vocabulary is noticeably different is word choice and spelling. Would you call these Pants? 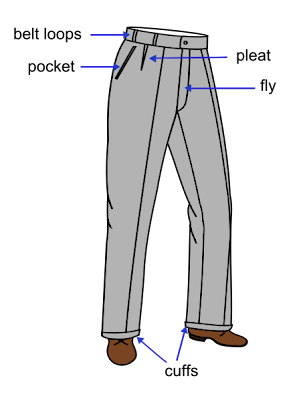 Trousers? Slacks? All of the above? A few “common” differences that I’ve noticed in British English are words like lorries (“trucks” in AmE, or American English), mad (meaning “crazy” in AmE), mobile phone (“cell phone”), petrol (“gas”), rubbish (“garbage, trash”), flat (“apartment”), lift (“elevator”), and nappy (“diaper”). Like I said, these are just ones that I’ve noticed on various occasions, but there are hundreds of differences. Still, in most situations, if speakers know you don’t always speak the same version of English as they do, they’ll make efforts to communicate clearly, without using as many difficult words or as much slang. You can find many words listed here, here, and here (the final link also briefly mentions differences between British and Australian and New Zealand English). Generally speaking, it seems like the categories with the most differences are clothing and food. But if you hear a word you don’t understand, you can say something like, “I’m not sure I’ve heard that word before,” or simply ask, “What’s that?” and people will usually be happy to explain it to you. A color wheel. Or is it a colour wheel? 1. -or/-our: There are various words that are spelled with “-or” at the end in American English, and “-our” at the end in British English. These include humor/humour, color/colour, and flavor/flavour. 3. -er/re: A few words have different endings, like “center” or “meter” (AmE); and “centre” or “metre” (in British and even Canadian English). In the end, these two types of English have much more in common than they have differences. If you go to New York and speak British English, you’ll probably have no problems communicating; the same is true if you speak American English in London or Scotland. Even though there are differences, the differences can often be fascinating, and they give English extra “flavor”–or is it “flavour”?? Thanks for reading, and if you have comments or you’d like to contribute to the discussion, please leave a comment below. Have a great weekend!